Did Jessica's distant aunt hold the key to a murder. Historic letters could solve a 140 year old crime. 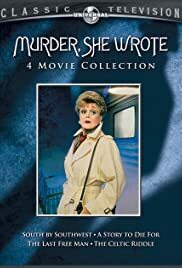 These 80-minute versions of Murder She Wrote do manage to bring out the best in the scriptwriters - a chance to breathe a bit deeper than usual. In Virginia, Jessica discovers a family link with a young black woman historian Cassandra, whose ancestor Sam was a slave owned by Jessica's ancestor Sarah. I immediately hoped they'd go into flashback, with Jessica in costume, and I wasn't disappointed. The scene is a big farmhouse wedding in 1860, the eve of civil war, where one observer says "Let's hope that this whole thing can be resolved without bloodshed" - a statement that would turn out deeply ironic. Sarah is in favour of paying Sam for some of his duties, but this heightens the divisions between the abolitionists and the slave-power. When the bridegroom is shot dead, Sam is the immediate suspect, and Sarah demands that he should be given a fair trial. But Sam urges her not to waste her time trying to fight for truth and justice. And sure enough, the local farmers hunt him down like a dog. Back in the present day, Jessica and Cassandra find themselves arguing with the curator of a historical museum, who believes in 'truth' or preserving the Southern cultural heritage - a slightly ambiguous agenda. When Cassandra finds her car booby-trapped outside the museum, history seems to be repeating itself. The underground railroad (the safe-house network where slaves were smuggled to freedom) turns out to be a big part of the story - as revealed by a 100-year old woman who can remember it. The dates may not quite fit, but it doesn't hurt the story too much. Sam is played magnificently by Michael Jace, deeply convincing as the long-suffering slave with the noble character who can rise above his captive status. So it was doubly shocking, just the other week, to see him jailed for 40 years for murdering his wife.